Living with Somalis is a two-way experience. For all the affection and care you give your Somali, you are rewarded with love and fun. A Somali needs a close relationship with its owner to be really happy - with a Somali you are not only the carer and cleaner but a foremost friend. Somalis are very loving cats needing affection as much as food - indeed many of them will ask for a cuddle before eating, no matter how hungry they are or how special the meal. Somalis also give a lot of affection. A Somali won't sit in the corner and hope to be noticed. He will be on your lap, rubbing your face and nuzzling your neck. With a Somali you will feel loved. Somalis are quiet cats but they do like to have a conversation. If you speak to a Somali you will usually get a chirrup in response. Somalis probably chirrup more than they meow. Somalis are intelligent cats capable of working things out and they like to be involved in the goings-on of the household. If you're cleaning out a cupboard your Somali will be there to help! They remain playful all their lives and mums have just as much fun as the kittens with all the toys. If you have only seen Somalis at cat shows, you need to see them in their own homes where they can relax and be themselves. For further information on the Somali breed, visit the SOMALI BAC. 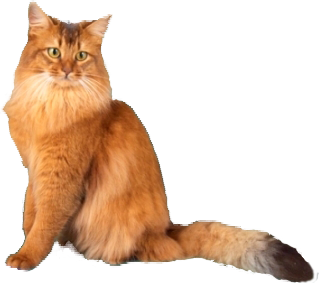 Any Somali Cat Club member who requires the discount code for Langford Veterinary Services Genetic Testing, please email us to request the current code.